Some writers have a gift to make characters memorable. This is sometimes because they are extraordinary, sometimes because they are reminiscent of someone we ourselves know, hardly ever due to an author providing exhaustive descriptions of them, and often because of something almost magical and hard to quantify that makes that character live for the reader. Very, very occasionally an author manages to create someone so alive, so charming, so witty, attractive and human that you might experience that sensation that people call 'falling in love' with a character. I don't think it's ever happened to me before but I should confess straight away (and please don't tell my wife) that thanks to Amor Towles debut novel I am ever so slightly in love with Katherine Kontent. Now, please don't think that I've had my head turned so much that I'm going to rhapsodise about a book that doesn't deserve the praise, Towles' book is funny, evocative, immediately involving and had me employing my patented reading-whilst-walking-down-the-street technique, but I'm prepared to admit that a large part of its appeal was because I genuinely cared about what happened to Miss Kontent, enjoyed every minute of her description of events, and desperately, desperately wanted to know what happened to her next. In fact having finished the book I can't help but wonder what happened to her after the final page. Oh dear, I have got it bad. A preface finds Katey Kontent (stress on the second syllable 'like the state of being') in 'late middle age' in 1966 attending the opening of Walker Evans' famous exhibition Many Are Called (the novel's epigram is the Bible passage from which that title was taken - Matthew 22: 8-14). 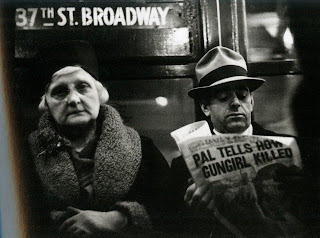 Evans' photographs of riders on the New York Subway were taken with a hidden camera in the 1930's, candid portraits of Depression era Americans that capture something indisputably authentic. A few of these pictures are used in the novel to separate the four main sections Wintertime, Springtime, Summertime and Fall, so I shall treat you to a few of them here too. Walking through the exhibition Katey spots a familiar face in one of the pictures - Tinker Grey. In this picture he is underweight and dirty but still with a bright eyes. Near the end of the exhibition he appears in another photograph; clean shaven, cashmere coat, windsor knot. Katey's husband, Val, assumes the two photographs show a man getting back on his feet but the dates show what she already knows: The later photo shows the broken man. 'Riches to rags' suggests Val. 'No...Not exactly' corrects Katey, and we are immediately hooked. What happened in between those two photographs to Katey's 'acquaintance'? We know from her reaction to seeing Tinker's face, the jolt it causes in her equilibrium, that we are in for quite a tale. It is a brilliant, enticing opening. On the last night of 1937 Katey is holed up in a low-rent bar with Midwestern gal Eve Ross. Her shoulder-length hair, which was sandy in summer, turned golden in the fall as if in sympathy with the wheat fields back home. She had fine features and blue eyes and pinpoint dimples so perfectly defined that it seemed like there must be a small steel cable fastened to the center of each inner cheek which grew taught when she smiled. True, she was only five foot six, but she knew how to dance in two-inch heels - and she knew how to kick them of as soon as she sat in your lap. These two friends from the secretarial pool have three dollars to their name, enough for one martini an hour then coffee, eggs and toast after midnight in a Ukranian diner. 'But a little after nine-thirty, we drank eleven o'clock's gin. And at ten we drank the eggs and toast' That is the point at which Tinker walks into the bar in his beautiful cashmere coat. Eve calls 'Dibs' in a good natured way but this becomes important because as the evening progresses, and indeed as the three of them continue their friendship into 1938, the exact balance of this menage is never entirely certain. When the proprietor of that Ukranian diner asks Katey whether the young man is hers or her friend's and she answers 'A little bit of both, I guess' he is quick to let her know, 'That doesn't work for long my slender one.' Fate intervenes rather dramatically when the three of them are involved in a car accident on an icy street. It is Eve who flies through the windscreen, Eve who suffers disfiguring lacerations to her face, Eve towards whom Tinker feels agonising guilt, Eve to whom he will attend. That is quite a beginning to a year of chance encounters - 'encounters which in the moment seemed so haphazard and effervescent but which with time took on some semblance of fate.' Tinker is just one of a whole new circle of friends that Katey makes, friends and acquaintances from a different strata entirely from this Brooklyn girl from a Russian family (Ah, that K begins to make sense now...), friends who will allow her to come much closer to achieving what such a well-read and intelligent woman is capable of. Among these is well-to-do Anne Grandin who introduces herself as Tinker's godmother and has some strong advice for a woman in whom she recognises the right qualities. In an age where most women are looking to make the right match, the match that will allow them to preside over 'scullery maids and table settings', Anne advises that she shouldn't be aiming to get into those women's shoes, but the men's. There is plenty of advice out there for a girl like Katey. Even the motto of the Beresford, where Tinker lives, is worth noting: Fronta Nulla Fides. Place No Trust In Appearances. The pursuit of those work ambitions as well as the personal ambitions any of us might have towards love and companionship are just some of the driving forces in the year ahead. There will be friendships and courtships, jazz music, journalism and plenty of martinis. Shooting parties, paper airplanes, hair dye and diamonds; this novel is filled with incident but it is the sparkle of the characters, their witty dialogue and whip-cracking humour that makes the pages whizz by. You can probably still picture those dimples of Eve Ross and weeks after finishing this novel I can still recall the halting speech of Wallace Wolcott, the wide-eyes of Dicky Vanderwhile as he extols the virtues of his bathtub, the bra-less threat of Anne Grandin. Towels has a talent for crystallising character, often through concise description of a single trait that suddenly brings them to life. His dialogue is funny, charming, sometimes so good it feels like you're watching one of those old black-and-white movies, and there is always a healthy bite to the exchanges whether it be from a desire to be witty, to outwit or to attack. On top of all this Katey is a bookworm. Oh joy! Early on in the novel during Eve's convalescence she picks up a Hemingway and reads to her from somewhere in the middle. Starting on page 104 made Hemingway's prose even more energetic than usual. Without the early chapters, all the incidents became sketches and all the dialogue innuendo. Bit characters stood on an equal footing with the central subjects an positively bludgeoned them with disinterested common sense. The protagonists didn't fight back. They seemed to be relieved to be freed from the tyranny of their tale. It made me want to read all of Hemingway's books this way. This is a girl with the nous to select Thoreau's Walden as her desert island book given that it contains 'eternity on every page' and to take some guidance from its philosophies as she attempts to guide a course somewhere between the aspiration to follow your 'pole star' and the need to find truth in the 'now and here.' And she also knows the unalloyed joy of reading, not just its importance in living a rewarding life, the way in which it allows us to measure our own happiness, articulated beautifully by an apparent non-sequitur fro her father as he lay dying. Whatever setbacks he had faced in his life, he said, however daunting or dispiriting the unfolding of events, he always knew that he would make it through, as long as when he woke in the morning he was looking forward to his first cup of coffee...in retrospect, my cup of coffee has been the works of Charles Dickens. Admittedly, there's something a little annoying about all those plucky underprivileged kids and the aptly named agents of villainy. But I've come to realize that however blue my circumstances, if after finishing a chapter of a Dickens novel I feel a miss-my-stop-on-the-train sort of compulsion to read on, then everything is probably going to be just fine. Reading this novel produces just that kind of compulsion (it also happens to have a tactile, and subtly foiled, jacket to die for) and if Towles can continue to write books of the same calibre then everything is indeed going to be just fine. It's a shame that I read this in ebook form because I missed out on some of the visual, tactile aspects. However, like you, I very much enjoyed it! Glad you enjoyed the book Yvann and thank you for commenting. Does the ebook have any of Evans' photographs or is it just the text? The dust-jacket is made of this paper that I've seen on a few books recently which has an almost rubberised feel to it. The printing of the text on the cover and the tiny copper-foiled lines are gorgeous too. The ebook had the photos in it but they were almost in the flow of the text and it was not until I saw the same photos on your review that I realised they were the photos from the exhibition! I share your emotional reaction to this novel - reading it almost became an addiction - my favourite novel of 2011 thus far. I read it in ebook and am sorely tempted to buy myself a hardcopy for the sake of having it as a visual reminder on my bookshelf of favourites. I always feel a sense of readerly camaraderie when I see someone reading as they walk down the street. Wanting to know what happened after the final page? When we manage our lunch remind me to tell you about the Donmar and the question about Mercurio that got asked at a post-play audience meets director and cast event. The names seem a bit odd. Katey Kontent seems a non-naturalistic name. The sort I'd expect in a comic novel or one where the characters were essentially thematic. Tinker Grey also sounds a bit odd. Eve Rose though seems much more naturalistic, though given the dimples and so on Rose I suppose is still thematic. Anne Grandin though seems much more everyday (or not, "grand-'un"?). Dicky Vanderwhile again sounds like a comic, possibly thematic, name. The first quote made me think of something I've seen a few times recently. Assumption of reader gender. "as soon as she sat in your lap" clearly assumes that you are a man. Is that generally true in the novel? Still, you really loved this one didn't you? I hope the author somehow sees it. It would make their day. The names, yes. Katey Kontent's curious K comes from her Russian heritage; Tinker is a nickname; Dicky Vanderwhile sounds like one of those grand American family names like Rockefeller. They're none of them easy to forget though are they?! Your point about assuming the gender of the reader is really interesting but not something I was conscious of whilst reading the book (perhaps because I am a man). It's narrated by Katey, and I actually feel like it's a book that deserves a huge female readership, but I take your point. Is it possible that the quote you mention doesn't so much assume it's a male reader but chooses the most effective image to convey the character? The assumed reader thing is something I've become aware of lately. I forget which book made me think about it originally. A surprising amount of fiction addresses the reader sometimes as you, and when it does so it's often evident that you are assumed to be another man. Once I noticed it I noticed it came up quite often. Of course here it does capture the character quite nimbly, but it was something that struck me. The names regard me slightly of some Waugh, each of them (regardless of in-fiction justification) makes sense for the character which is a trick that was once very widely used (Mr Gradgrind and so on) but that seems to have gone out of fashion with the overwhelming rise of naturalism. No reason not to use it though.